One of the most majestic jets to ever fly in our skies and to capture the world’s imagination is the Boeing 747. 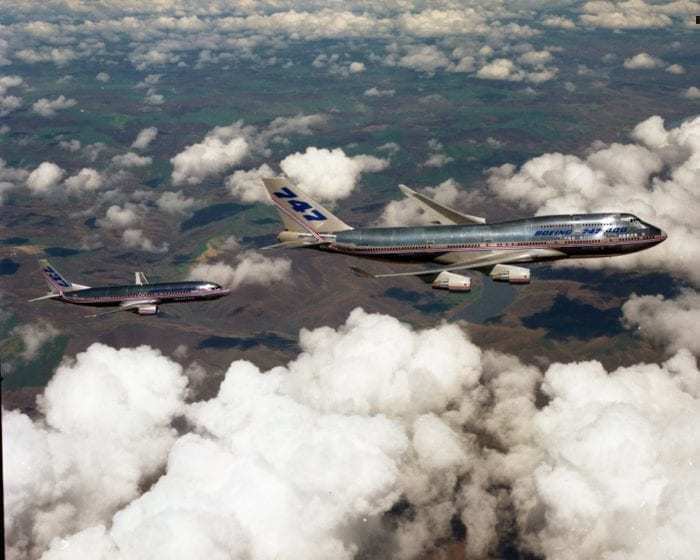 And now we can celebrate together as the mighty 747 turns 50. 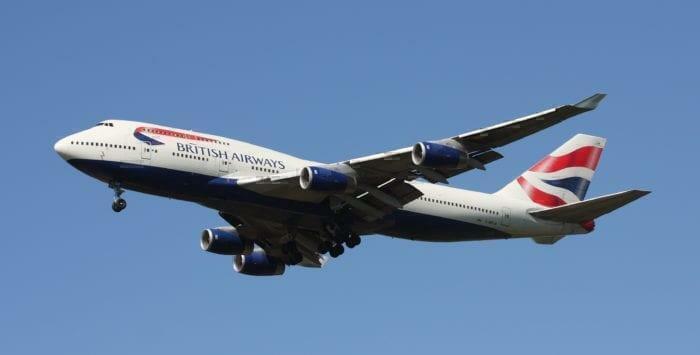 A BA 747 taking off. Where was the 747 born? Originally, in 1969 the 747 was conceived to be a new military freighter for the US airforce. You can see that it has all the hallmarks, multiple big engines, cockpit and flight deck elevated on a 2nd level, and on some prototypes, an opening nosecone (which would come back in a big way for the 747-8 freighter). 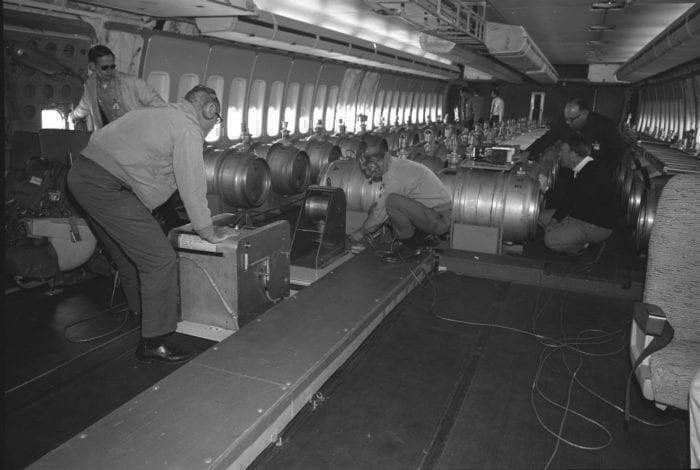 The Boeing 747 prototype with ballast tanks to simulate weight. The final design that was offered to market came in three variants. All passenger, all cargo, and a third mix that allowed seats to be slid out and replaced with large cargo ‘pods’. This pod design would later come back for a possible ‘cargo class’ for Qantas. The aircraft was so tall at the time that as it was under construction, test pilots would wheel around in a mock-up wagon three stories above the ground. 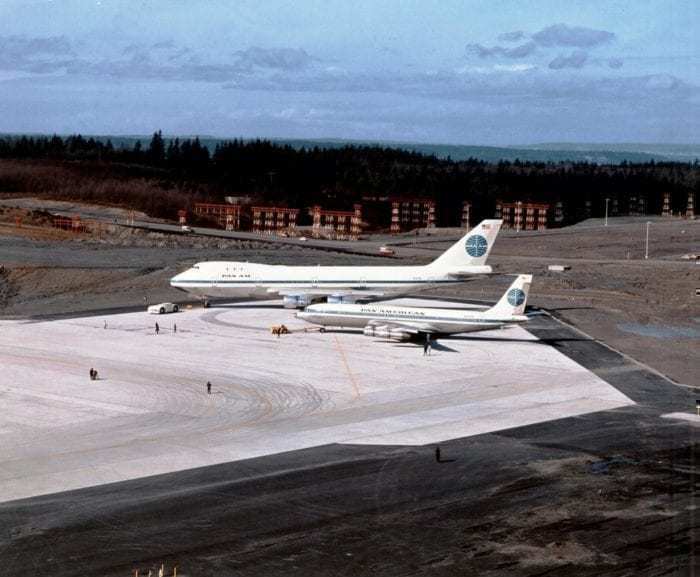 Boeing was forced to build a vast new factory that could fit up to three 747s side by side. The first test flight took place on February 9th, 1969. After it’s first flight from New York to London, the 747-100 aircraft became instantly successful. Many airlines wanted a ‘Queen of the skies’ as their flagship and it was a sign of prestige to acquire one. In a recent article, we wrote how pivotal the 747 was for Singapore Airlines. The 747 became the new staple of air travel, and by its first birthday, over 1 million passengers had flown on it. And it saved Boeing as well. The company had strongly believed that the Concorde was the future of air travel, that faster was better than bigger, but had decided to bet $2 billion dollars on the slower 747. And it paid off in a big way, with a constant stream of orders that lasted up till 2017. 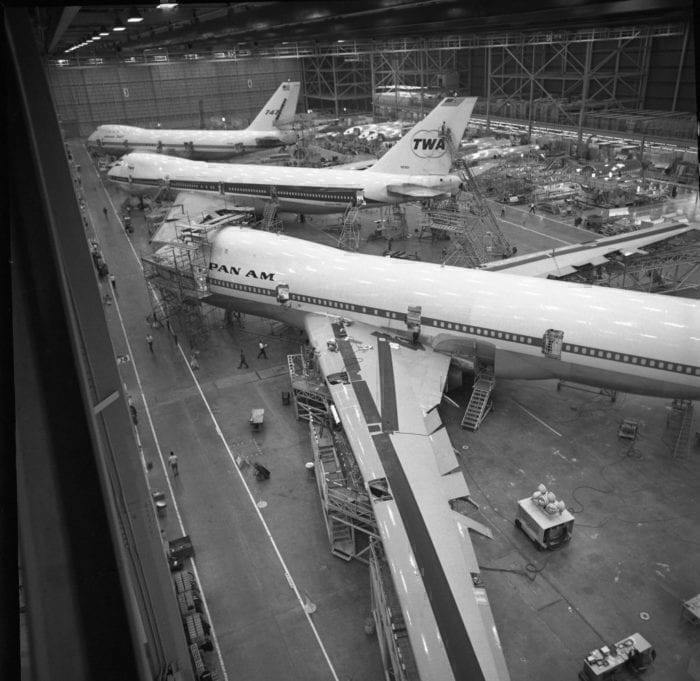 From here, Boeing refined the design and shape of the 747. They created more commercial versions, such as the 747-400 and the 747-8. The Boeing 747 on display at a show. Iconic special variants were also constructed, such as the Space Shuttle carrier for NASA, the heavy Dreamlifter and of course, Air Force One. As we mentioned, Trump’s presidency is currently designing and choosing what the next generation of Air Force One will look like, strong favorite is the tried and true 747. What does the future look like for the Boeing 747? With many airlines slowly phasing them out, the Boeung 747 is finding its place in the world slowly shrinking. 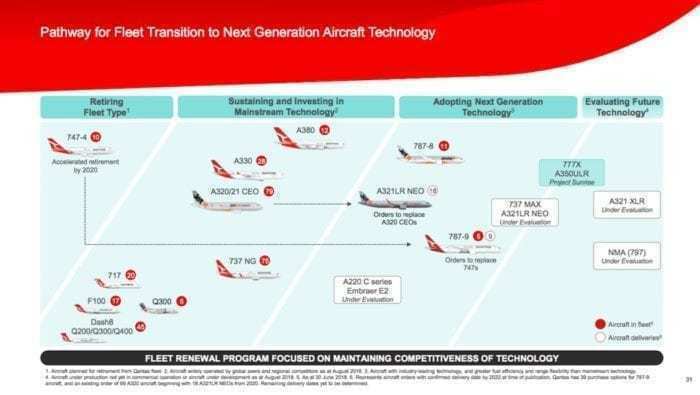 As planes have become more fuel efficient and their range extended, new options have opened up on the market place for smaller (easily filled) jets to take over 747 routes. But the Queen of the skies will always have a place in our hearts. If you have not flown on one, you can still catch them . But watch out, of 1,500 built, only 500 are still flying today. Do you remember the first time you rode in a 747? Let us know in the comments below. My first flight on the 747 was on the second 747 made at Boeing going down to New Mexico for brake testing. There was a poker game in the main cabin engineering table where the parachutes where stored. The pilot was in the game. Sat upstairs for take off. It was great. I flew my first 747 in early summer 1970 on TWA from JFK to ORD. I was hooked. My favorite plane. Last flew business class in March 2017 from ICN to SGN on Asiana. Love to fly again!! Seattle to Tokyo in January of 1972 in N603US. First class on Northwest Airlines thanks to my father being an employee. We arrived to late in the evening to continue to Hong Kong so after an overnight is the airport hotel we were off to Hong Kong and Kai Tak airport. 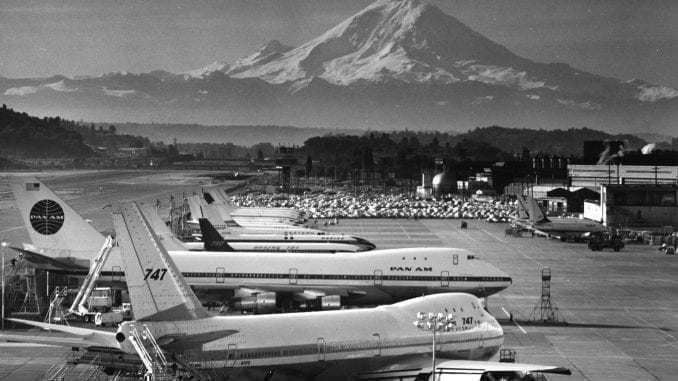 The trip continued to Tokyo and then returned via Seattle and Chicago, all on 747s. The hop to Minneapolis was on a 727 which suddenly seemed tiny. The first time I flew a 747 was on a very cold 0800AM, January 1970 on Northwest Airlines. MSP-MIA with an intermediate stop at ORD. The flight attendant had big hair and spoke Spanish, English and Japanese. The flight from MSP-ORD was about an hour and it took the entire hour for the cabin to warm up. A hot, full breakfast was served. The captain was a friend of my dad so I was allowed to sit in the jump seat for the ORD landing. ORD-MIA, We were provided a tour by another flight attendant who took us through the end of the cabin and back. We sat in the first row left in first class. Lunch was served.On approach to MIA we encountered a thunderstorm over the Atlantic Ocean and one of the engines was struck and shut down. We landed on three engines without incident at MIA. Walked down the stairs to the tarmac where my mom was waiting. I carried my souvenir pilot wings, silverware, real Noritake china, linen napkin, glass glassware and plastic meal tray. Yes, the crew actually let me take meal service items as a “thank you” for flying NWA. We picked up our luggage at the new baggage carousel within minutes of our arrival. Times have certainly changed. My most memorable was a flight on an Air France 747-400 from CDG to SFO in 2004. A passenger had a heart attack, and I watched the fuel dump out my window while circling over the North Sea before an emergency landing at LHR. I was on that plane for 14 hours as we couldn’t deplane at LHR. They had to pull the live animals out of the cargo hold. Quite an ordeal, really. The stricken passenger was conscious and talking upon being evacuated…that was a good thing. I was part of The Walking Dead by the time we got to SFO. My first 747 was a Pan Am flight in 1983 from London Heathrow – Washington. Then returning 3 weeks later San Francisco – London Heathrow. I was traveling on a staff ticket as I worked for a charter airline in the UK on 737- 200’s as Cabin Crew doing Holiday Charter flights and Pan Am gave the best discount to airline crews and it was £45 return. I boarded in the middle door and the crew were eating their meals in the Galley and ignored us all . I sat 10 rows from the back and on take off I was in panic mode as it took off so slowly I thought we would never make it off the runway. The flight was cold, smelly and there were 5 off us in the rear section. they came down with a drinks service and right behind the meal trolly with coffee. And that was It. for 8 hours !. The return sector was the same and I sat with my coat on the hole time. Then in 1986 I flew Virgin to Orlando from London Gatwick and after that I never flew a 747 again. The A/C wasn’t exciting as I thought it would be and preferred the 767 – 200/300 for long haul. My first flight on B747 was ATL-SFO in 1970 as my entire army company was headed off to Vietnam. The thing I remember was the length, the middle seats and how the back of the fuselage curved inward forming the rear cone. More than my first flight, I still remember my first sighting of the 747. I was standing outside and noticed her larger and certainly unique figure in a perfectly clear and sunny sky. I must’ve been 16. I’m 65 now. As a Four-Million Miler today with DAL, I then, as I do today, ALWAYS fly in a window seat. Back in 71 Pan Am and British Airways offered a short 2 hour flight between New York and Bermuda.Back then it was $200 round trip! I bought my tickets so I would fly down via Pan Am and return on British Airways, both with a window seat. Upon approaching the Island it was THEN when I really got a greater idea how large this beauty was as she kept descending making a 90 degree turn and seeing its ” shadow” on the turquoise water. God,she was beautiful! I was a little wary though as the plane was getting so close to the water,able to see sailboats and the faces of the occupants looking at us I asked ” WHERE THE HECK IS THE ISLAND? ” A moment later I saw WAVES splash against the rocks and finally over the runway as the bird first sunk her rear and mains touch the runway. One whole small island was used for the runway which I found amazing.